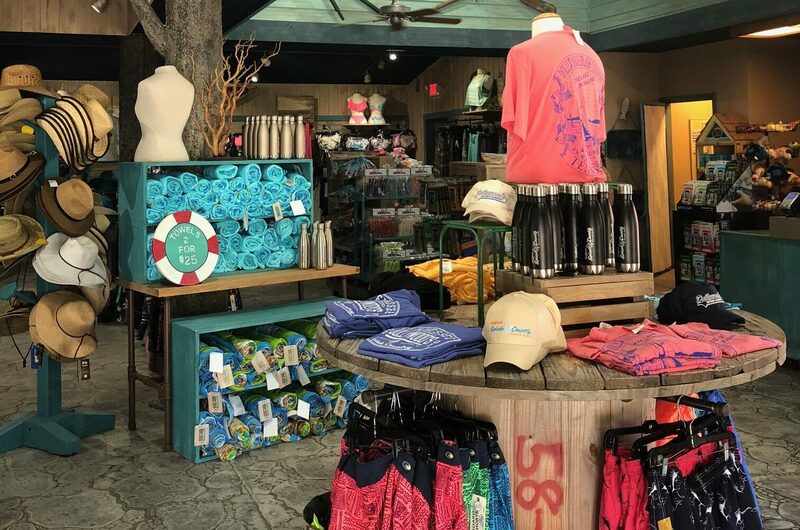 What Happens at Dollywood’s Splash Country in the Winter? 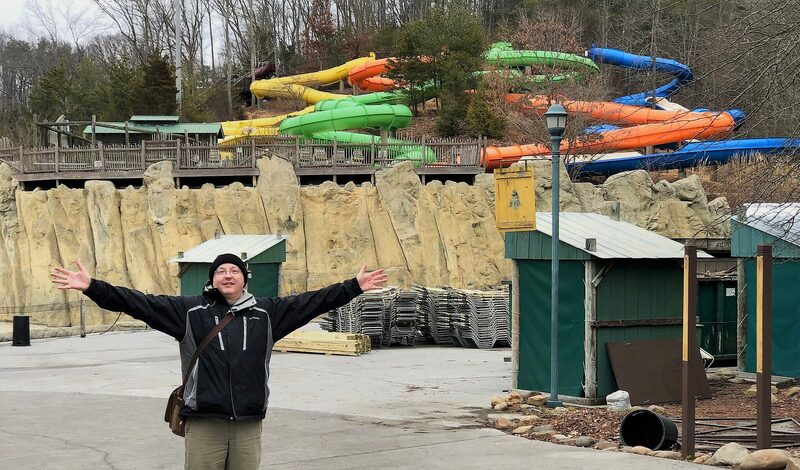 Who would ever dream of visiting a water park in the middle of February, right before a snow storm? 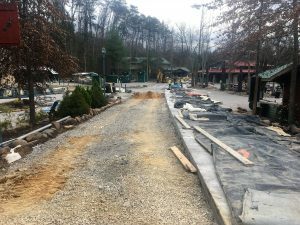 As one of your intrepid Dollywood Insiders, I’ll brave the cold (or any weather) to bring you all the behind-the-scenes information about Destination Dollywood. 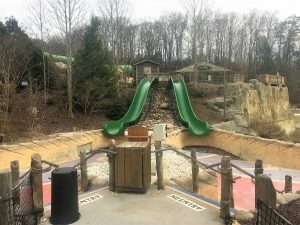 During my visit to Dollywood’s Splash Country, I was looking forward to seeing what a water park looked like in the off season. Would there be ice in the lazy river? Snow coming down the slides? I mean, it was about 28 degrees and I had my gloves, a knit hat and multiple layers. It was cold! 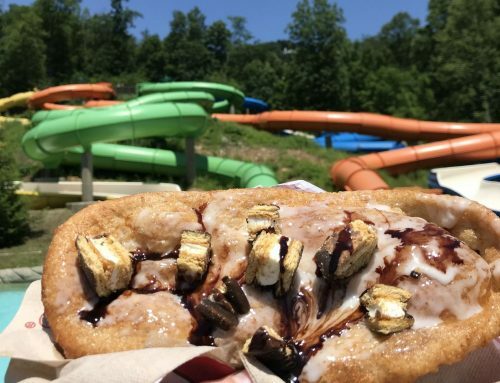 What happens to a water park during the winter? So, they don’t just turn off the water, lock the gates and leave! 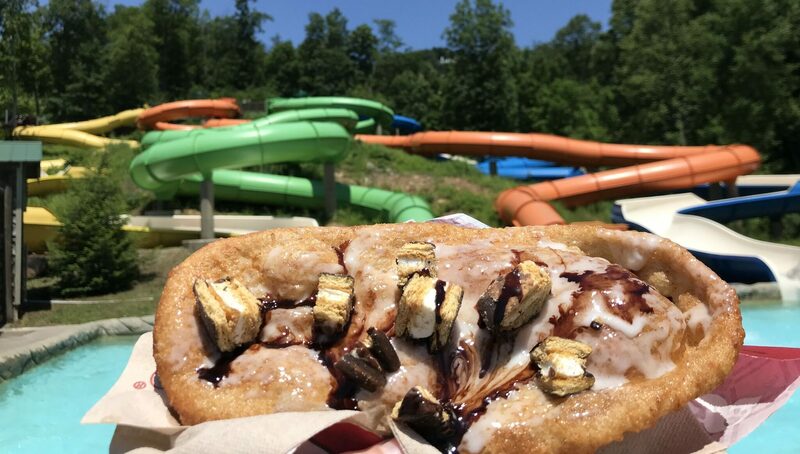 There’s a crew of four full-time maintenance staff (in addition to about five other year-round managers) who work in all types of weather, from September to May, to make sure that Dollywood’s Splash Country is safe, beautiful and fun! Let’s take a look at what happens when the water park closes for the season. I got to hang out with Kris Hull, Operations Manager for the park. He took me around on his awesome golf cart to show me what’s in progress. First, the park has to be winterized. 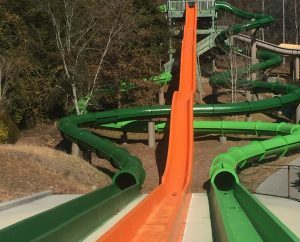 This means that the water does have to be emptied from all 16 attractions—and every pipe in the park. 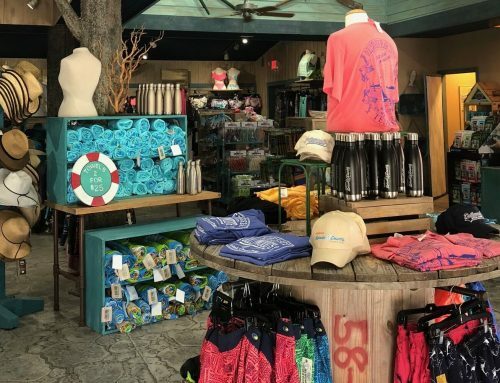 Even the ones from the food and beverage locations. That whole process takes more than a few days. Then, they have to blow out the pipes and seal them. Next, the gang works on routine and special maintenance. This year, Mountain Scream and The Butterfly were repainted. 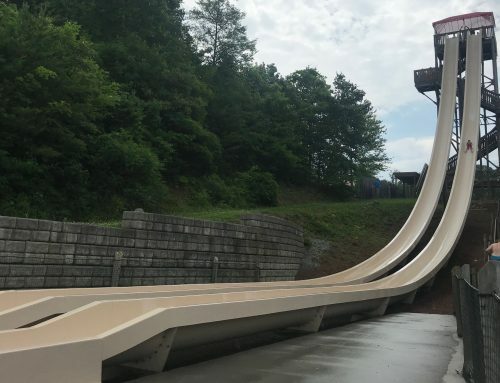 Did you know—when they paint the slides, they paint the outside AND the inside? The new colors pop and I know they will still be some of the fastest water slides around! They also spent a lot of time on the Bear Mountain Fire Tower, an interactive multi-level play area. They replaced some of the wood with Trex® decking (which will last so much longer) and they spruced up some elements. I had no idea the splash bucket was big enough to hold me! 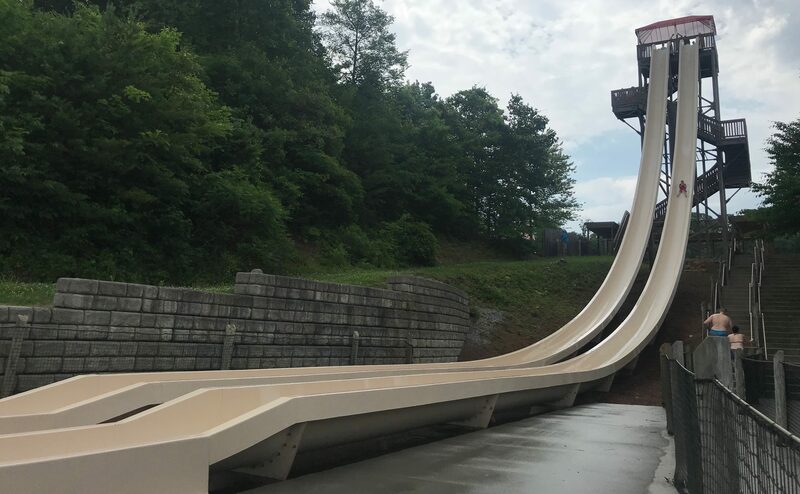 The crew also power washes the outside of the slides when needed, work on making sure all the filtration systems are working, and do any needed maintenance. Maintenance can include replacing concrete, fixing steps, painting the lazy river and repairing fences. Basically, they keep a running punch list and they always have something to work on. Once all of the projects are finished, including setting up new chairs and getting the buildings ready, the crew starts to get the rides ready. First up, they turn on the water! When the water flows, they can check for leaks and see how things are holding up. They can make any corrections and tighten joints. If the attraction passes muster, then they start getting it ready. That means the water has to get shut off again, and the slides and interior surfaces have to be waxed: it’s like waxing your car. They wax all of the surfaces that you ride on with an industrial buffer. This is mainly for protection of the ride surface. They have to wax all of the hills and bumps on the ride. Then, they test the rides. Starting in April, staff members get to ride the attractions! Kris mentioned that they do wear wet suits, on occasion, especially when it’s cold. As much fun as water parks are, I can’t imagine going down a racing slide when it’s 50 degrees! During the testing phase, and multiple times throughout the year, there are local and state inspections. Equipment is checked and water pressure is monitored. You have to make sure the attractions are operating at the proper specifications to maximize guest safety and enjoyment. Kris said that they still perform maintenance throughout the summer—it’s just not as exhaustive. There are still safety checks, equipment checks and vigilant water testing every hour when the park is open. 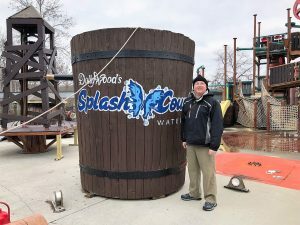 I enjoyed my short and cold visit to Dollywood’s Splash Country to check out the amazing work done by the maintenance crew. And no, the BeaverTails building was closed. I guess that means I will come back often once Dollywood’s Splash Country opens for the summer! 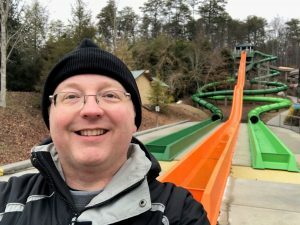 George Taylor (Dollywood Insider 2017-2018) is a librarian by day and a theme park nerd, well, all the time! He's been writing about theme parks (travel, history, book reviews, etc.) since 2007 at his site, ImagiNERDing.com. Last year, George started a YouTube channel to share his passion for roller coasters and theme parks. When he's not reading a book about theme park history, he's probably planning the ultimate roller coaster trip with friends. So far, George has ridden 119 different coasters and counts Wild Eagle, Lightning Rod and Thunderhead at Dollywood as three of the best coasters in the United States. 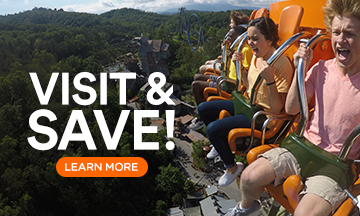 George wants to share his passion about Dollywood's history to help you have an amazing trip, even if you're not a fan of roller coasters, because Dollywood has something for everyone!